The news came out few hours ago, (you can check it here) that American TV & Video providers NetFlix have restored the restrictions placed on Nigerians from accessing to their live TV shows, movies, etc. This is gonna be a good news to those here who will have another choice aside from DSTV and other video-providers in the country. Here is the code to subscribe to Etisalat NetFlix Video plan. How Much Is It? 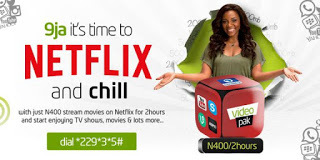 Etisalat NetFlix plan costs N400naira for 2 hours of video streaming. Am i mad? Have seen this anyway.